Planting some jams we forgot in the trash heap out back the store today. I don't know what these are...tulips from Alice and Stu's wedding maybe? 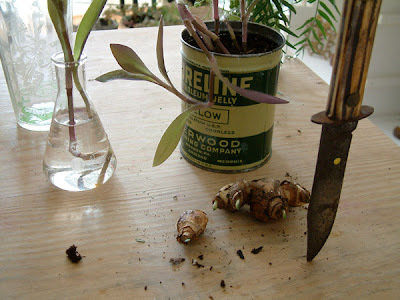 Also propagating more purple heart into old coffee cans. Brother Neil [Young] recently said music has lost it's power to change the world. This statement was the calalyst for a recent edition of Jon Schafer's Sound Check titled Music and the Power to Change. The show circuitously contrasts the music of 1968 (specifically Bookends by Simon and Garfunkel) with popular music of today. Pete Fornatale reads aloud the lyrics of the recent #1 song in America; Flo Rida's Low. "Apple-bottom jeans...boots wit tha fur..."
In 1968 everyone was listening to Simon and Garfunkel. Take the song America (my favorite) for instance...a song documenting the bus trip of two soul-searching friends looking to find AMERICA. Alas, what they see is drastically different than the America burned in their consciousness - I mean it's the New Jersey Turn Pike kids! What if Simon and Garfunkel rewrote that song today? The same kids would be on a Jet Blue flight to Miami un-communicating through their iPods. What happened to music is clear to me; its sucking a bank roll somewhere in an LA corporate office tower trying to find the next nobody to rap lyrics that will be even more offensive to women. Ironically, young women will here this new song, think it's funny and post video's of themselves dancing to it on YouTube. I'm just saying.. Tune back in later for some pretty things with no ranting. I love the Erlenmeyer flask in your pic! One thing I miss about lab work...the glassware. The 4 liter ones are fun. Your latest blog entry sparked an interesting discussion in our household today about popular music. Go Sarah with the stimulating thought! But then dinner was ready and that distracted us. Boo vegetarian chili for dampening dialogue!